The MXR M-80 is a great distortion for bass players. Add this to your board today. 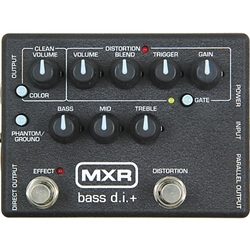 The MXR M-80 Bass Direct Box with Distortion is more than just a direct box. It's got so many features, you may wonder how you ever did without it! It includes a distortion channel with gain, volume, and blend controls; a noise gate to help keep it clean; a Color control; and 3-band EQ control that lets you dial in any tone you need. It also provides phantom power, and sports a parallel output jack for flexibility in routing. Whether you like it sweet and clean or hot and nasty, this DI does it all!